Produktinformationen "The Science of Taekwondo"
We have commonly heard and said “Taekwondo is martial art and sport of science.” Due to my shortage in the knowledge, however, I have not been able to pinpoint what aspects of Taekwondo make its own scientific features. As we know, of course, Taekwondo cannot be explained enough without science. For all the substances in the universe, whether they are large or small in sizes, make their movements only under the laws of dynamics. The movements in Taekwondo also cannot do away with these laws of dynamics. It won’t be easy, however, for ordinary people to mobilize all those advanced physics or bio dynamics to analyze such scientific principles embedded in Taekwondo techniques. That was the point where I started to think to write a basic manual that anybody could pick up and read through easily. Therefore, I have tried efforts to see Taekwondo from scientific point of view to the extent that the level of science stays as high as to fit high school students. Thus, I have come to conclusion that this could open another way of perspectives to look into Taekwondo. Even though this book could not define every aspect of Taekwondo in light of science, I am confident that it will provide you with a new perspective through scientific study. Also, I believe that it will bring meaningful achievement in enhancing Taekwondo techniques as the capabilities in analysis and comprehension on Taekwondo techniques improves through the lever of science. This is not a book of science. Nor is this a Taekwondo manual. For, you won’t be able to learn science, nor secrets of Taekwondo through the book. This book is all about ‘Taekwondo,’ and ‘science,’ only to the extent anyone who has ever exercised Taekwondo would already know. Ironically, however, this book will function as a book of science, and as a Taekwondo manual. 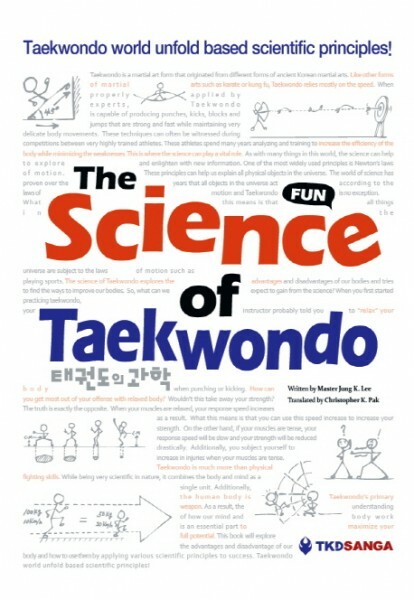 For, those who know Taekwondo would get to know more about science, and vice versa. If you take closer looks at Taekwondo, you will be able to find out how science works vividly in it. The world of Taekwondo based on principles of science, and science that you can learn through Taekwondo - these are the two main themes of the book. Weiterführende Links zu "The Science of Taekwondo"
Unser Kommentar zu "The Science of Taekwondo"
Kundenbewertungen für "The Science of Taekwondo"